Raw concrete ceilings are concealed beneath the faceted green roof of this environmental education centre in the Czech town of Vrchlabí, designed by Petr Hájek Architekti to sink into the topography of the surrounding parkland (+ slideshow). 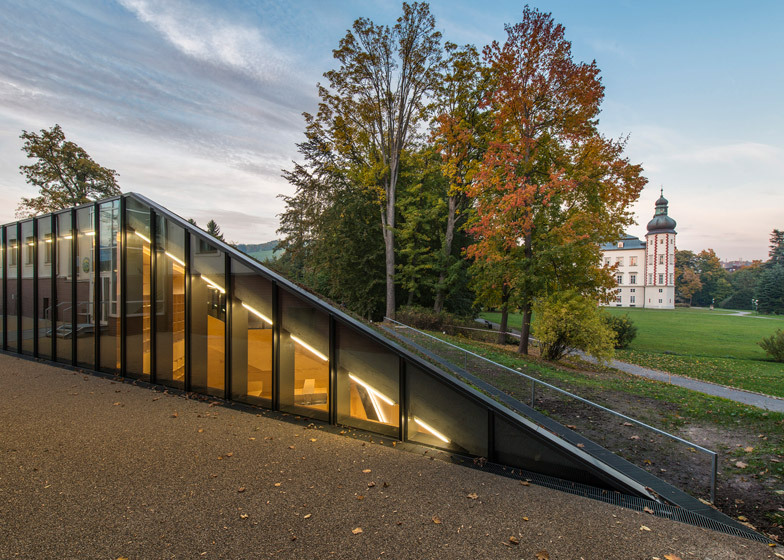 Prague office Petr Hájek Architekti designed the Krkonoše Mountains Centre for Environmental Education (KCEV) at a park that also contains a 16th century castle, and it sits alongside an administrative building for the nearby Krkonoše Mountains National Park. 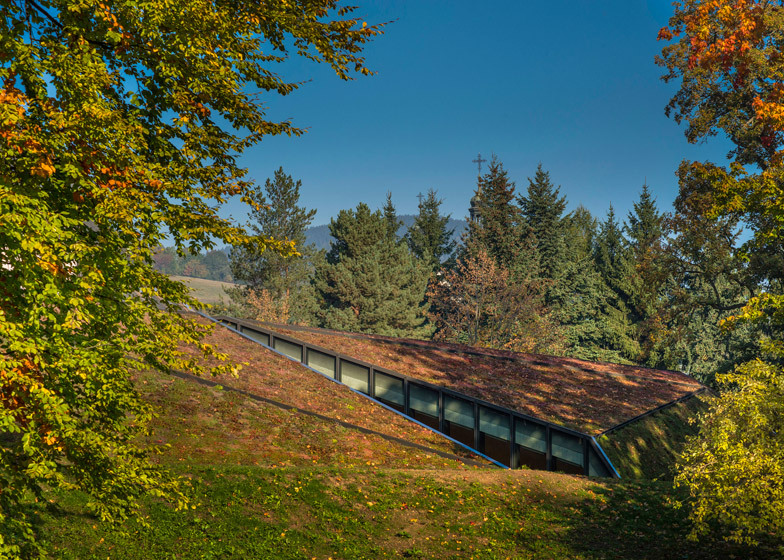 To minimise its visual impact on the surrounding parkland, the building is partly submerged in the sloping site and its ridged roof is covered in growing sedum that acts as a camouflage. A passageway separates the new building from the existing administrative headquarters and leads to the entrances of both buildings. The new centre is aimed at promoting ecological awareness, and contains a conference room, classroom, exhibition space and research laboratories. The undulating geometric surfaces of the building's roof directly reference slopes found in the Krkonoše mountain range, which marks the border between the Czech Republic and Poland. 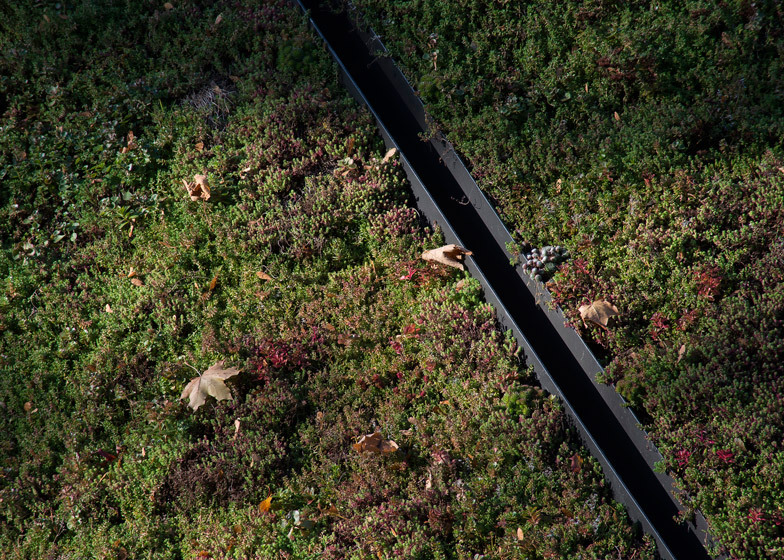 Metal gutters in the gaps between the roof's angled planes are intended to represent mountain ridges and break up the natural appearance of the sedum surface. The sheer wall facing the existing building is fully glazed and allows visitors to observe lessons taking place in a classroom on the basement level, which features laboratory benches and library shelving. A doorway next to the staircase in the teaching facility connects this room to a triangular exhibition space, which adjoins an auditorium with banked seating for 76 people. 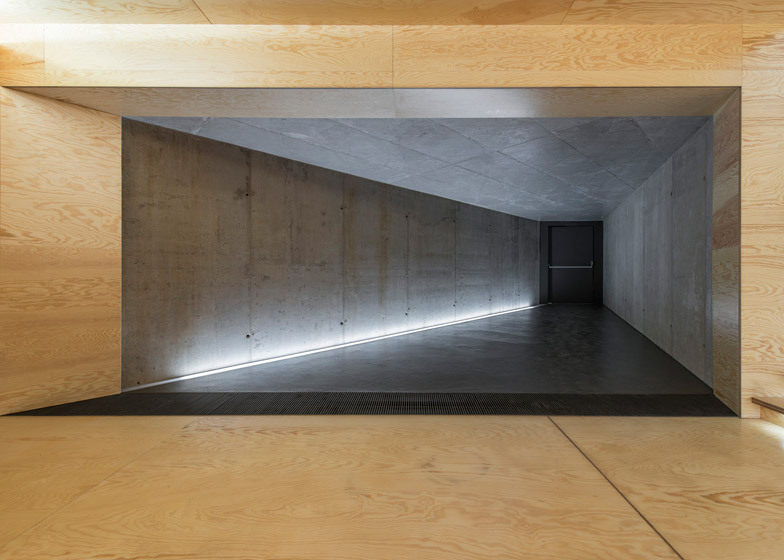 The triangular plan of the exhibition space sits below a section that is spliced from the rear of the building to accommodate glazed walls at ground-floor level, allowing natural light to reach the rooms below. 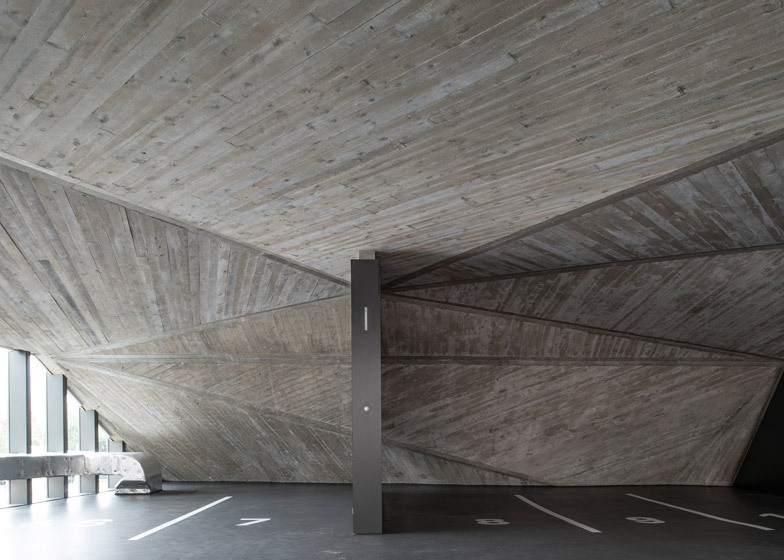 Structural concrete used for the building's shell is left exposed on internal walls and ceilings that retain the faceted surfaces of the exterior. 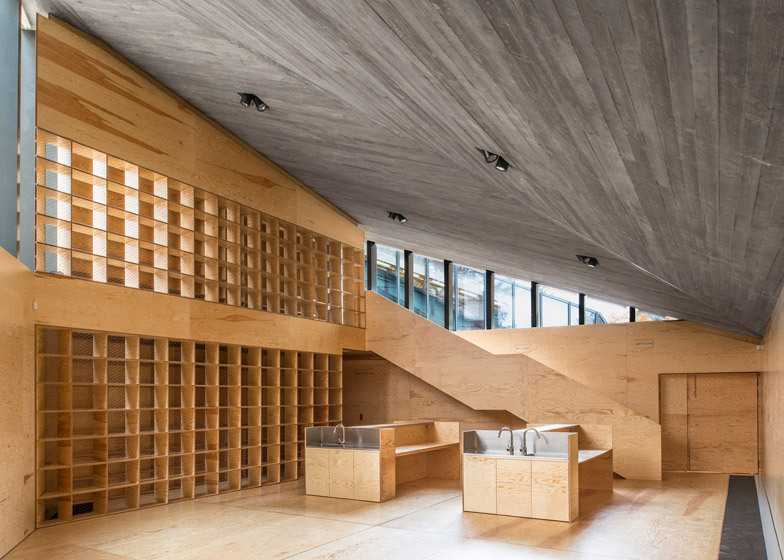 Plywood with a prominent grain adds a natural counterpoint to the raw concrete and is used for flooring, furniture and infrastructure including the staircases and shelving. 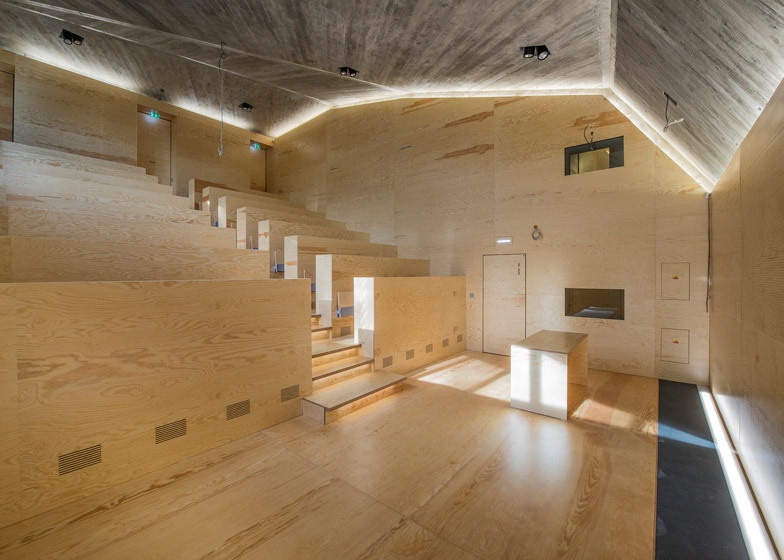 The design of the internal structures was based on the dimensions of the raw wooden sheets to reduce the amount of waste material. 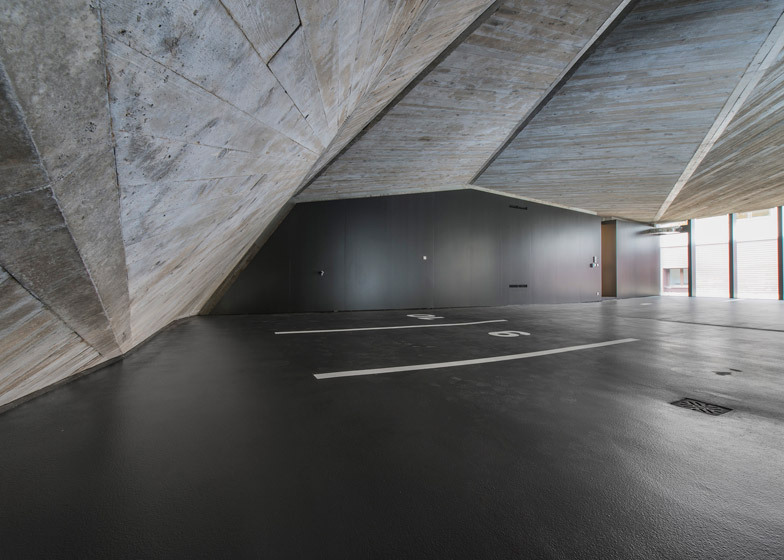 A car park is also nestled beneath the sloping concrete ceiling and illuminated by daylight entering through the glazed wall. Photography is by Benedikt Markel. 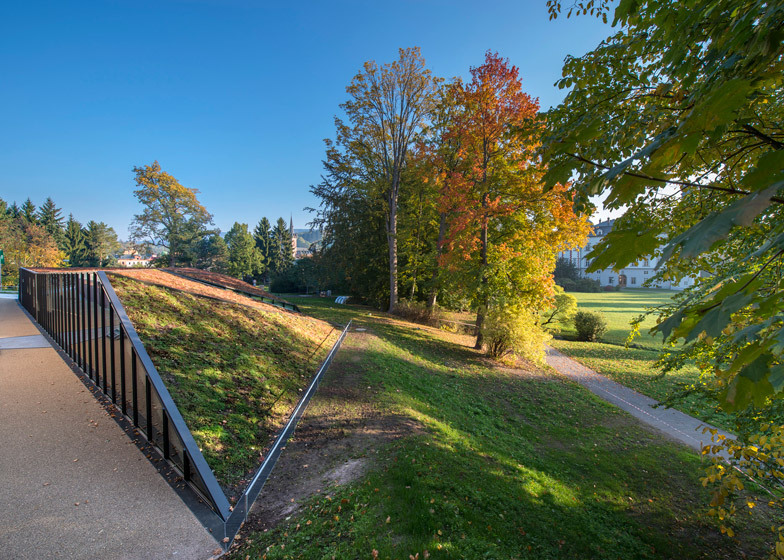 The building is situated into a city park in front of the administration building of KRNAP (Krkonoše Mts. National Park). The building geometry is derived from the geometry of Krkonoše Mountains. Every edge or slope on the building could be found in its real, natural topography. In between of the metal vectors, which represent the mountain ridges, there is growing sedum. The new building is set apart from the existing one to create an entrance platform. This public space atmosphere is supported by fully glazed side wall through which it is possible to look into the building and indirectly become a part of an ongoing lecture or seminar inside of the building. The building itself is energy efficient and should represent the ideas of the National park and preservation of nature. Main bearing structure and underground walls are made out of face concrete. 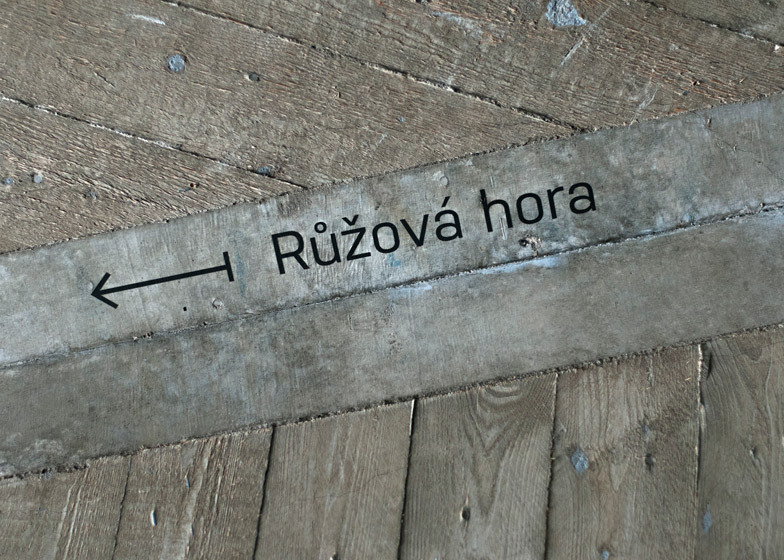 Inner partitions and furniture are made out of plywood. Design of furniture and dimensions of its basic parts are adapted for the size of plywood plates and because of that there are no wasted residues.